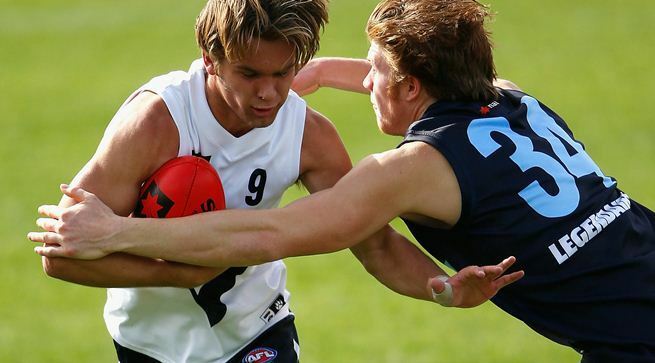 After trailing at every break, a five goal burst in the final quarter from Vic Country set up a 15 point win over Vic Metro in the first game of the 2014 NAB AFL Under 18 Championships. Vic Country victorious 14.5 (89) defeating Vic Metro 11.8 (74) as Kate Mitchell reports. The long standing rivalry between the boys from the bush and the city ensured the big crowd at the Trevor Barker Beach Oval was treated to a tight contest, with the lead changing multiple times throughout the game. Country set the tone early with good clearance work feeding their tall forward line; Patrick McCartin opened the scoring with a strong mark and goal. Metro were quick to respond with good ball movement and run through the middle setting up Peter Wright who kicked his first. Metro broke the goal for goal trend with a major right before the siren and went into quarter time with a 10-point lead. With a strong northerly wind gusting down the ground, Country had the advantage in the second term, but it was Metro who had all the possession early, Angus Brayshaw with 19 first half disposals running riot. Both teams struggled with entry into their forward 50, the wind making long kicks in hard to judge, with the defenders from both sides able to easily repel the ball back out. A free kick paid to Metro down field put Darcy Moore 20 metres out in front of goal. Moore converted, breaking the scoring deadlock, extending Metro’s lead. Country then went on a scoring run with three goals in four minutes. Darcy Parish, McCartin and Hugh Goddard all had the scoreboard ticking over and reduced the deficit to just three points going into half time. Metro started the second half full of run, Rory Sherridan-Ferrie combined well with Wright who kicked his second goal for the match. Country wrestled the lead back through Goddard who took a strong pack mark and cleverly used the wind to curve the ball through the goals from close to the boundary. Two more goals to Country were quickly answered by Metro, Sherridan- Ferrie showing his agility and finishing skills with two goals for the quarter, his fourth goal for the game giving Metro a seven point lead at three quarter time. When Metro goaled with ease through Paul Ahern to start the final term it seemed they were poised to run away with the game. Country lifted their work rate and the momentum shifted, all of a sudden it was all Country. Jack Lonie, Tom Lamb, McCartin, Nathan Drummond and Lukas Webb all kicked goals in quick succession, putting Country up by 17 points. A tense final five minutes ensued as Metro peppered the goals but were only able to kick one major. A snap from Lamb with a minute to go sealed the win for Country in an entertaining and hard fought contest. For Country McCartin finished with three goals, Darcy Tucker had 21 disposals and Caleb Marchbank was solid in defence with 20 disposals and five marks. Sherridan-Ferrie kicked four goals for Metro, while Brayshaw finished with a game high 32 disposals, six marks and nine inside 50’s. Matthew Goodyear another solid contributor for Metro with 24 disposals and seven marks. In the trial game following the main match, it was Vic Metro victorious by 49 points, with a number of players from both sides staking their claim for a spot in the final squads of 40 which will be named for Vic Metro and Country prior to Round 2 of the Championships. Round 2 NAB AFL Under 18 Championships action will see Vic Country take on South Australia in Adelaide (June 1) and Vic Metro playing Western Australia in Perth (May 31) in two weeks’ time.